For my STEP project, I completed an internship with Boeing in Seattle, WA. My position was in 737 Flight Controls where I worked with the Stabilizer Trim, High Lift and Pilot Controls systems. I utilized my STEP funds to help pay for housing, food and gas while I was living in Seattle. This internship helped provide guidance for my education and career in mechanical engineering. I learned so much working in the 737 factory and getting tours of the facilities. This internship contributed to my academic and professional growth as a student. Living in a completely new city 3 time zones away from your friends is a huge growth opportunity. I was forced to get out of my comfort zone and be open to exploring the city on my own. The public transportation system was great and allowed me to go downtown for food and shopping. I had always heard how bad traffic was in Seattle, but never fully realized until living there how true the rumors were. Commuting each day was a struggle, but I got to see a great view of Mt. Rainier as I drove to work! Seattle is a completely different atmosphere than Columbus, OH or Huntsville, AL where I am from, however I think it is valuable for everyone to travel and immerse themselves in a new place to experience a different culture and region of the world. 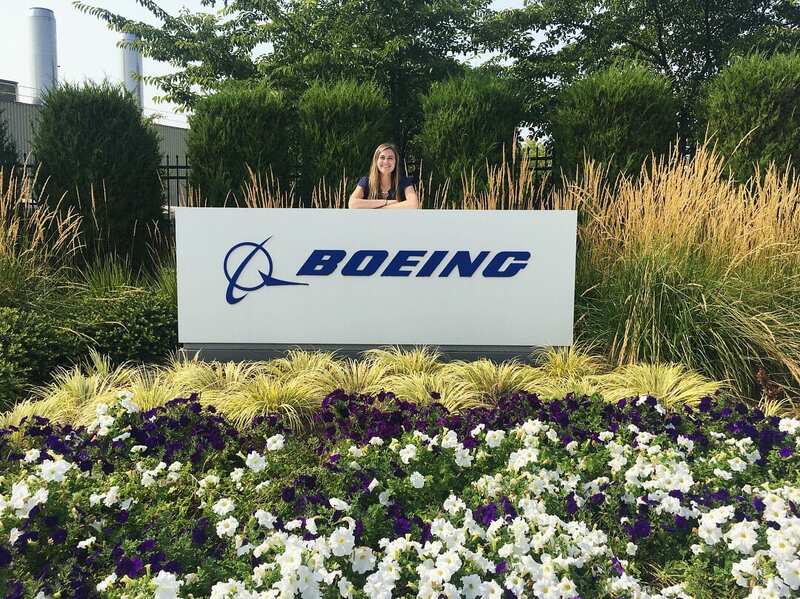 Working for Boeing was an incredible experience that opened my eyes to what I want to do with my future career as a mechanical engineer. I knew that I enjoyed the aerospace industry, however this internship solidified that was what I wanted to pursue for a full-time position. I conducted lots of informational interviews to hear and learn more about opportunities within the company and possible career paths for a mechanical engineer at the company. With my work, I focused on learning as much about 737 Flight Controls as I could in order to be a contributing member to the team. This ultimately led my manager to offer me a full-time position at the end of my internship which I was incredibly excited to accept. As someone who is naturally more introverted, it is a little scary to put yourself out there and move across the country for the summer. I was fortunate to have a roommate who accompanied me on many of the weekend hiking and camping trips, however a lot of the time I was on my own to figure out my way around a new city. Even seemingly simple things were different in Seattle than the cities I was used to. For instance, there were hardly any fast food restaurants that I was familiar with near my apartment in Seattle so I adapted to the local grocery stores and restaurants around town. I soon realized driving downtown was a giant headache, so I mastered the public transportation system and acquired a pre-paid card to swipe my way on and off buses. I learned to love the hustle and bustle of the popular city and began to feel at home after living there for several weeks. I made friends who were from the west coast and it was really interesting to hear about their lives and how their schools operated different than mine. At the beginning of my internship, I knew nothing about 737 Flight Controls. One week into my internship my coworker took me down to the factory floor and asked me to name every flight controls surface on a plane being built. I struggled but managed to name all but one. By the end of the internship, I had a good grasp on secondary flight controls as I had worked heavily with the functional testing of the stabilizer trim and high lift systems. In addition, I supported a design project on the control column. Becoming knowledgeable about flight controls gave me much more confidence as an intern and an aspiring engineer. Conducting informational interviews at Boeing was a valuable experience, as I fostered many great relationships with coworkers that I know I will continue to stay in contact with. 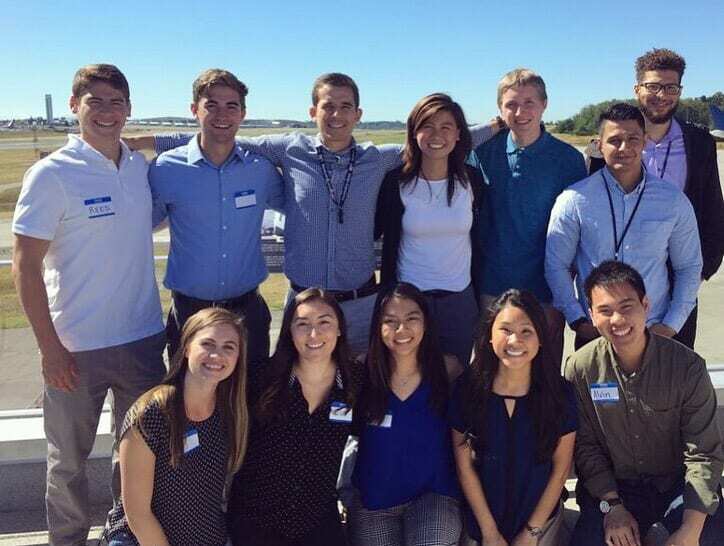 They offered great advice for my future with Boeing as well as potential career paths. I would recommend anyone interning to hold informational interviews. Not only is it a great way to get to know people, it is also a good way to learn about opportunities. I was able to get to know many mangers and senior managers in my department, which will be valuable upon returning next year. 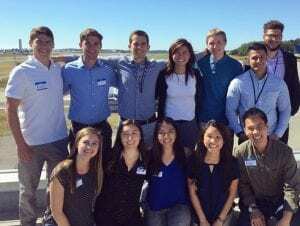 My Boeing internship experience was significant in paving the way to receive my entry level position upon graduation and a chance for personal growth outside my comfort zone. I did not realize when my internship started that I would be working to prove myself and gain that full-time offer. Working hard and connecting with my coworkers was essential in getting an offer. I feel very happy with my plans to return and excited to begin this new phase of my life after graduation. Boeing gave me a good foundation over the summer to begin working with Flight Controls and gain experience in that sector of the company. In addition, this experience helped me grow my confidence with myself as an engineer and almost full-fledged adult in the working world. The transition period during college, when you are given a lot more responsibility but still not at the capacity of a working adult, is important in setting you up for the real world. 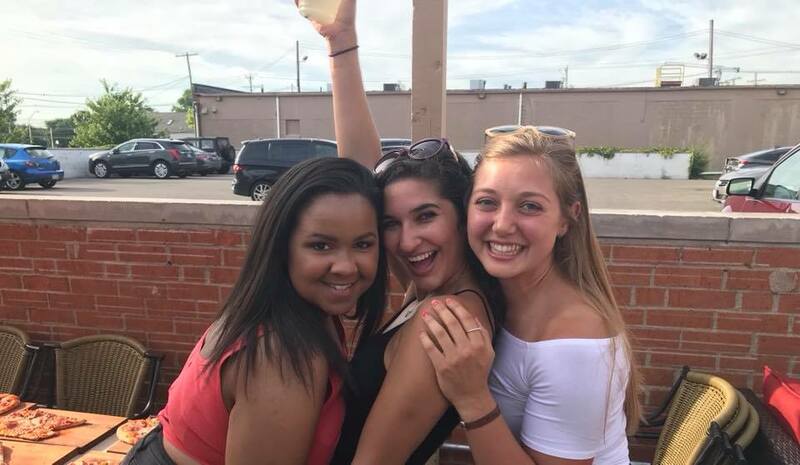 By participating in internship experiences, I was able to gain skills that aren’t taught in the classroom and learn about living alone and transitioning from student to full-time. I can say that after my two college internships I have completed, I feel prepared to make that transition and feel more confident looking towards the future. I had the opportunity this summer to intern with Cole Trucking which was the focus of my STEP project. 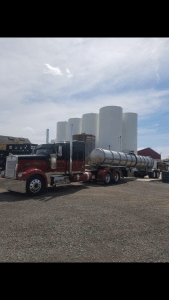 Cole Trucking is located in Alvada, Ohio and is a private owned trucking company that hauls heavy wiring to corporations such as Menards and Lowes. My main objective this summer while interning with Cole Trucking was to manage the routes for the employees and handle the payroll. It was a great challenge that kept me on my toes the entire time. I was in charge of the scheduling of the employees and other various task as the summer progressed and I became more comfortable with the business operations. This internship really helped me close the deal on Logistics Management being my focus for study as I close out my time here at Ohio State. I had never worked in a logistics setting job before, and this allowed me to really appreciate what I had learned in my classes leading up to this internship and allowed me to branch out with more knowledge from the internship that I will take with me for the future. This STEP project was a great opportunity for me to close my options and ideas on what kind of career I want in the future. While working at Cole Trucking there was some events where I felt very pressured to assure a set schedule for the drivers. Going into this internship, I assumed the hardest part of the position was going to be the payroll. The payroll ended up being rather simple and enjoyable for me where as the schedule became very challenging. The driver’s hours ranged from 2am to 4pm, and the needed for steel and wiring would vary each week depending on what the location needed. It was hard to find a pattern on ordering and delivering that would work for the employees and the store locations. One of the biggest challenges faced while working on the scheduling was the new logging system that was implanted halfway through the summer in our trucks. The electronic log system requires the drivers to take a break from driving after so many hours or miles whichever reached the limit first. This caused for many breaks during the driver’s day that caused less loadings and more frequent trips. I am thrilled that I was able to work through that challenge, but at times it became very stressful. Cole Trucking is owned by one man Deryk Cole who owns 6 trucks and has 5 employees who haul wire. A majority of the days I was in the office alone answering phone calls and meeting scheduling and payroll deadlines. However, some of my days were spent driving to nearby towns and cities to recruit for job positions that were available in the company and to recruit new store locations for deliveries of wire. It was interesting to go out of the office and meet with people for different reasons at locations I was not familiar with. That really pushed me out of my comfort zone and made me realize that a sales position would not be an ideal career for me. I was glad that I was able to experience a position that was outside of the office, so that my options of future careers were narrowed down. Overall, it was a wonderful opportunity that I am thankful STEP allowed me to pursue. I learned so many valuable traits and gained so much more knowledge for the logistics side of business. I was able to create valuable relationships with many career opportunity people and was even offered a job from after graduation. It was a wonderful opportunity that I was glad to take part in. The company treated me like family, and even on late nights allowed me to be comfortable with no shoes on in the office! It really was a wonderful experience. My STEP signature Project was a summer Internship with Huntington National Bank. 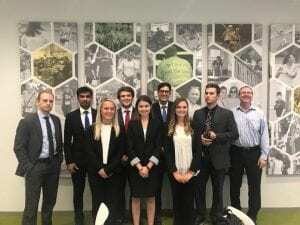 I spent 12 weeks in the Capital Markets segment of Huntington where I learned important financial information, contributed to a team, and made a lasting impact. I discovered just how capable I was via my STEP project. Throughout my junior year, I was nervous for what to expect while working for a national bank like Huntington. I knew I was going to be walking into a fast-paced environment and would be surrounded by some very experienced people during my time at the bank. During the week leading up to my first day I was extremely anxious about making mistakes or not being as prepared as I was supposed to be. I didn’t want to disappoint the other employees I work with. I quickly realized that everyone I worked with was there to encourage, teach, and aid me throughout my summer. Additionally, I began to realize just how capable I am. This realization led to me gaining confidence in my ability to complete an impactful internship with Huntington. The other intern I worked with had a very positive impact on me. His name is Alex, and even though he goes to Michigan, I still managed to get along with him. Alex and I collaborated on dozens of projects and initiatives throughout the summer. Through these projects and initiatives I realized just how capable I really am. One specific project we worked on was a process map for the lifetime of a large corporate loan. This process map had dozens of steps and miniature processes within it, so it was definitely a challenge. Alex was very excited for the project. I, on the other hand, was nervous with how large it was. As we got to work, I began to notice that the project was not as tedious and un-doable as I had thought. Through collaboration with Alex as well as my own concentration and problem solving, we were able to complete the process map after a couple weeks. After we had completed the project, we were asked to present the process map to some of our colleagues. The presentation was just another cause of stress. I was worried I didn’t know the material well enough to present effectively. After collecting myself, I began to understand that I do know the information, and that I should trust myself more. After the presentation, many of my colleagues complimented Alex and I on our preparedness, thoughtfulness, and execution. It was great to be complimented by such intelligent and experienced people. Overall, my confidence and trust in myself grew with each project, presentation, and bit of knowledge I collected throughout the summer. This change in confidence and trusting in myself is extremely valuable to my life. Because I have more confidence and self-trust, I have become more of a go-getter, more outspoken, and more inquisitive. In regards to academia, I will now be able to approach difficult projects with a more open mind. Instead of shutting down and claiming I’m too stressed to go on with the project, I will be able to break it down into manageable chunks. Breaking down the project will allow me to better understand what I am working on in order to execute that specific project better. In regards to my personal life, I will make less assumptions of others. Instead, I will ask questions and for other people’s opinions and perspectives in order to come to a complete decision. This will, in turn, increase communication and transparency between myself and my friends, family, and peers. In regards to my professional life, I will now know how to effectively navigate a fast-paced, competitive, and inclusive work environment. Working at Huntington could be stressful at times, but on the other hand it could also be very fun and light-hearted. I will now understand that my professional life will have ups and downs, but in the end, trusting in myself will get me to where I need to be. For my step project, I interned at Ohio State’s Plant Pathology Department in the lab of Dr. Ye Xia. In the lab, I assisted in preparing and sterilizing equipment, recording measurements, and assisting in the extraction of DNA. I also helped out in the greenhouse with activities such as sterilizing pots and trays, collecting tomatoes, taking measurements of the tomato and Arabidopsis plants, and transplanting Arabidopsis plants. One of the assumptions that I had of lab work was that you would be in the lab all day every day. In my mind there was nothing about lab work that happened outside of the lab. I also thought lab work would be monotonous and that there would be no opportunities to talk with people. Through my internship, I learned that lab work is not monotonous because new tasks develop as the research develops. These tasks often took me out of the lab and into the greenhouse. I also learned that in a laboratory setting, there are plenty of opportunities to talk to people in the lab I was working with as well as other laboratories. Those in the Plant Pathology Department promoted collaborating and helping others through these conversations. The main activities that took me off guard, and out of the lab, were working with the model organisms. I never thought about collecting samples, inoculating, and taking care of the plants. Looking back, it seems so naïve that I thought lab work only pertained to performing experiments and had nothing to do with taking care of the model organisms. Zhenzhen, a graduate student in Dr. Xia’s lab, taught me that maintaining the health of model organisms is a critical aspect of lab work because a lack of health can detrimentally affect the study. I also found that I had enormous pride in seeing the plants I had transplanted flourish in the growth chamber. In addition, the greenhouse work also showed me one of the ways that lab work is varied. One day I would collect tomatoes and the next day I would go to the lab and collect the seeds from the tomatoes. Going in between the greenhouse and the lab was only one way that my tasks in the lab varied. I did multiple tasks within each space, which were often influenced by the research development and the stage in life that the plants were in. Lastly, the interactions I had with members of Ohio State’s Plant Pathology Department showed me that there was plenty of social interactions to be had in a lab environment. During lunch breaks people would often talk about their work and conferences that they had or were preparing to go to. By listening to these discussions, I was able to better understand the scope of research and form connections with other members of the department. Another wonderful opportunity I had to learn about the research happening throughout the department was a department tour. During this tour, I was able to hear about the kinds of exciting research that each of the laboratories were doing. I saw how Ohio State researchers were working on new and pressing problems, such as the disease affecting beech trees in Ohio, and that they solved these problems. The reason I loved this experience was that I was introduced to a lot of people and felt more a part of the plant pathology community after this tour. The people of the department also answered questions I had about their research with enthusiasm and made sure that I knew they would love to talk more about their research with me at any time. Their passion was contagious and I was able to see how research concepts I have previously learned were applied to their real life situations. Since laboratory work is one of the future jobs I was considering, it was great to enter that environment. I now have been introduced, and have a feel for the expectations and social interactions that happen within the lab. The internship with Plant Pathology has helped me realize that many of the preconceived notions that I had about working in a lab are wrong. I also loved working with people who are passionate about their work and willing to help you grow and learn more about their field. The support and community were the greatest aspects of my internship. That being said, my internship has also showed me that working in a lab is not something I would wish to pursue as a lifelong career. While your day to day activates change, I feel like I would like a greater variability in my career. I would also like to work more with, and for, people. While there are many opportunities to socialize, there is also a lot of time where you are on your own completing a task. I did not realize how much I liked working with people until I spent hours on my own performing a task. In addition, being in a lab and working for months to years on a project, while it can benefit many people, feels too removed for me. I would like to be able to aid and benefit people in a more immediate fashion in my future career. Without this internship, these are aspects of myself that I would not have otherwise realized. These insights will help me when it comes to deciding what career to choose. The main activities that my STEP project consisted of was taking care of animals and taking training classes. I Interned at the Ohio Wildlife Center, and my duties consisted of feeding, medicating, cleaning, and caring for orphan and adult animals at the hospital. 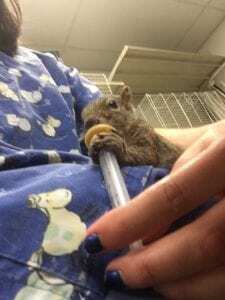 I also participated in training classes, such as baby feeding, where I learned how to properly tube feed or use other methods of feeding for the animals. My internship this summer transformed my understanding of myself as well as the world around me. I learned more about myself because I have always had trouble being confident that I can do certain things, such as tube feed a small baby animal. However, after feeling a bit down the first few times that I felt like I didn’t get a hang of it as fast as some other people, I finally got it and could do it much more confidently. This was important to me because it helped confirm that I am capable of helping care for animals, which is something really important to me. It showed me that even if I don’t get something as fast as other people, after awhile of practicing I am completely able to do it and be comfortable. My perceptions of the world around me also changed with this project. I learned more about the professionals and other people in this career field, and was able to talk to some professionals that I would have been more intimidated of before coming into this project. I also learned about the other interns, and how our past experiences were different or the same based on where we went to school and other factors. I made a good friend during my project, which is an important part of my life. One event that led to me becoming more confident in my animal care abilities was when I was finally able to tube feed an opossum. This was a bit challenging, and I felt down at first. Another intern showed me how to do it but I felt like I couldn’t catch on. After about a week, I was able to get the hang of it and figure out how to comfortably do the task and be confident in myself. This was a big moment for me as it showed me that there are many other things in the veterinary field that I am nervous about being able to do, but that when the time comes I am sure I will be able to do these things. A relationship that led to my transformation was a friend I made with another intern. She helped encourage me a lot when I felt unsure of my abilities, and it helped me be more confident. 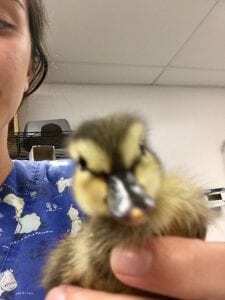 She was also lots of fun to work with and we became friends outside of the internship, which helped me transform my views on what a job environment in animal care could mean for me. Lastly, one of the vet technicians that I worked with a lot helped transform my views on animal care and wildlife. She always went above and beyond to care for the animals, and treated each one with high importance. She worked nonstop, but was always in a good and helpful mood. She was really open to teaching, and it helped me have a great experience and learn what type of person I would like to work with and work like in the future. These transformations and changes matter in my future career goals, as well as my personal goals. The change of learning how to be more confident, knowing how to work hard, and learning what type of person I want to work with in the future will help me with my goals to work in animal care or veterinary care. My transformation of making friends and learning more about myself has already helped me in my life, as I am more open to taking risks working in new places and meeting new people. This internship was a great experience for not only future goals, but for me as a person today. 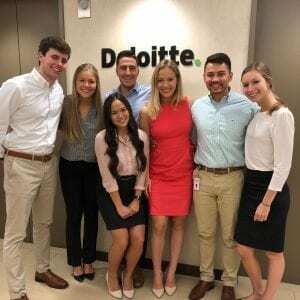 For my STEP project I did an eight-week audit and assurance internship with Deloitte, a public accounting firm here in Columbus. I spent the majority of my internship auditing a publicly traded power and utilities company. I think one of the big changes that took place was shifting from the classroom to the workplace. I assumed it would be a lot harder for myself to switch from one to the other. I quickly had to become used to sitting in one place and working continuously for eight to nine hours a day, instead of short one-hour classes and all the breaks in between. I also assumed it would be harder to translate what I learned in the classroom to my job, but quickly found that I was able to pull information I learned in class and put it in to practice. However, I also assumed I would need to know a lot more coming in than I did but realized that I would learn a lot on the job that didn’t necessarily need to know or remember from the classroom, I was honestly shocked at how much learning and knowledge I gained in such a short amount of time, by actually working as compared to just sitting in a classroom. My team was very supportive when I was working through my various project. Any questions I would have they wouldn’t hesitate to pause what they were doing and come walk me through whatever I didn’t understand. They gave me helpful feedback on my work, that usually required me to fix some things, but that gave me a great opportunity go back and learn from those corrections. They challenged me to leverage the knowledge I already had from the classroom and use it in my work. They challenged me with work that they knew would be difficult for me but with their guidance I was able to work through. The experience I had form the classroom working in teams was very helpful to use in this very team-orientated environment. Another large part of my internship and one that really transformed me was my interaction with our firm’s clients. My team did not hold my hand when it came to those interactions, and instead encouraged me to take those interactions head on. They gave me a few tips at first, but after that I was on my own to meet and contact the clients for information and support we needed. This challenge was difficult at first especially the first time I was alone with the client and felt like I had no idea what I was even saying. After a few more interactions and a little more support on what questions to ask from my team, I began to really feel comfortable with those client interactions. Soon I was confident in these interactions and felt that I really was able to get the information my team needed from the interactions all on my own, it was one of the points my team called as a big positive during my internship. This whole internship, and all my experiences were very valuable for my future professional and career goals. First it was my first real opportunity to experience public accounting and see if it was what I really wanted to do. I got to experience some of the work I would get to do in my early years, how to interact with clients, and how the team dynamic works in public accounting. It also allowed me to leverage what I have learned in the classroom and reaffirm my decision to major in accounting. 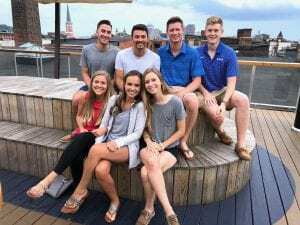 The internship allowed me to expand my professional network, not only with professionals already working in public accounting, but with those working at my client, and fellow interns, all of which could be useful down the road. 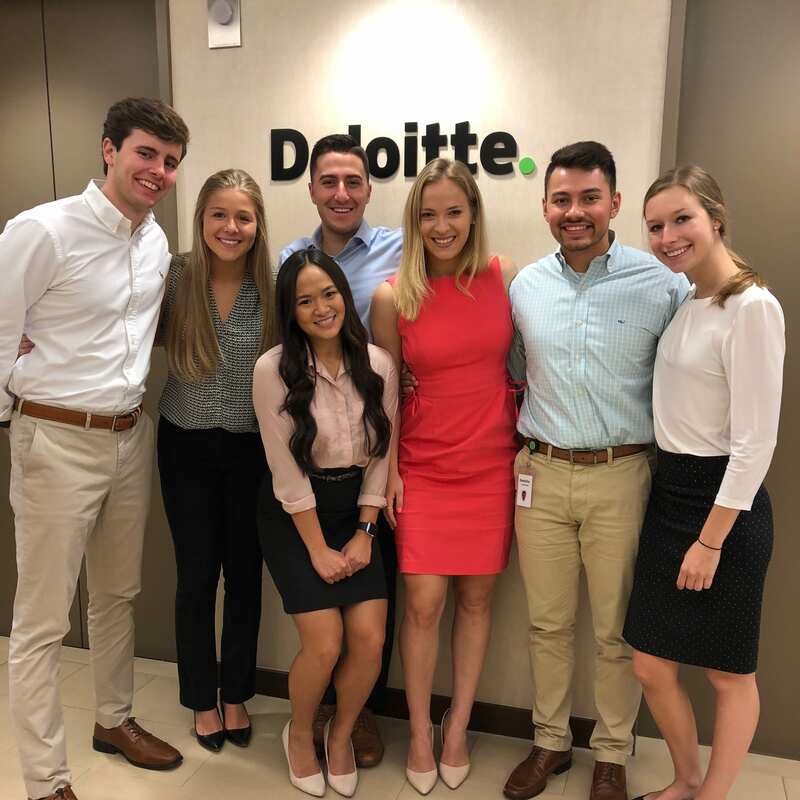 Finally, this internship provided me the opportunity to return to Deloitte full time following graduation. My STEP project fell under the internship category. I spent ten weeks this summer interning for Abercrombie & Fitch at their home office in New Albany, Ohio as a Business Analyst Intern. 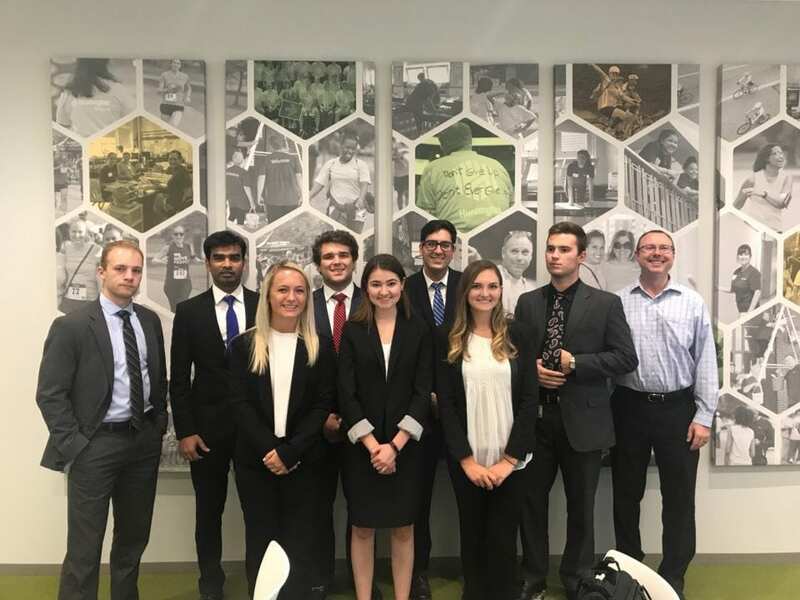 Working on my STEP project this summer as an intern I learned a lot about myself.Given the classes I had taken over the years at OSU I felt that I had a good understanding of the business world. What I didn’t know was how much experience I would be gaining through on-site experience. My assumptions changed when I saw how much I grew both personally and professionally. I was able to foster new relationships and gain insight to the business world. Ultimately, I was able to see how my major would fit into my daily life and how I needed to adapt to the new lifestyle it provided. Something that really affected me this summer during my project was the actually working part of it. I realized the biggest adjustment I had to make was tailoring my life to include the working day. Throughout school I had been used to making my own schedule and thus, my own hours with as many breaks in between as I needed. I found that adjusting my body to the 9-hour workday was a hard one but one that I figured out along the way. Help from my supervisor and mentor and lots of cups of coffee definitely allowed me to complete this part of my growth. 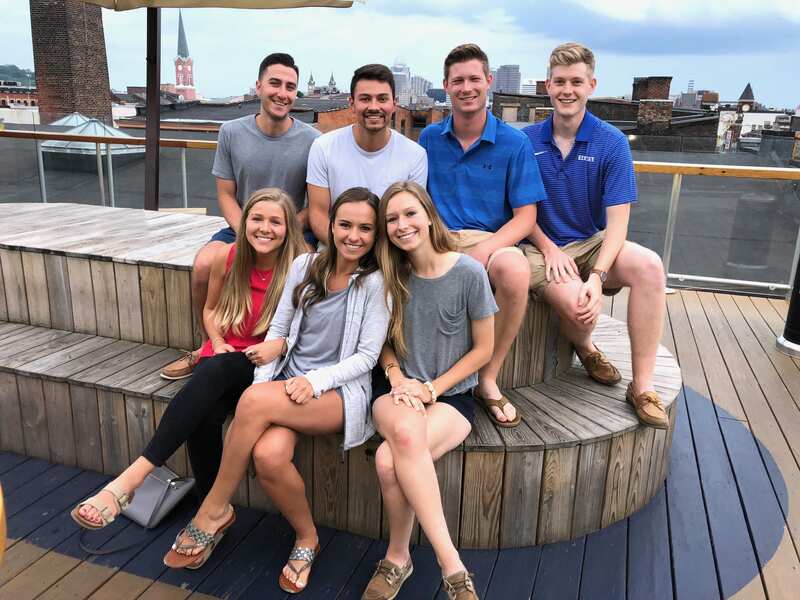 It also helped me critically think about the business work week and whether or not it would be something I would want to permanently adopt in my future.The second critical aspect of my internship was the professional growth I was gaining. I was learning how to apply what I learned in the classroom to the field. 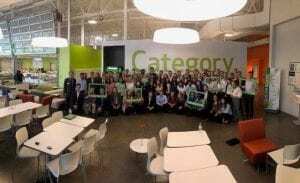 This was the first time I was able to experience the business world as a whole and how all the different parts and pieces intertwined together. With the help of my supervisor, I was able to connect my studies to my work, meetings to reports, and facts to decisions. By the end of my ten weeks I had learned the company lingo, how to analyze their business, and how to present my findings in a concise and logical way in order to provide the foundation to leadership to make higher-level decisions.The last aspect of my project that was critical to my future was the work that I was doing. This internship was especially unique in that what I was doing on the job did not necessarily correlate with my marketing major. That’s not to say my business classes had not prepared me for the work, because they definitely had, but I found myself analyzing information and numbers a lot more than I had found myself doing actual marketing. I appreciated the work I was doing, and definitely felt I was valued, but I was missing something, and that thing was the integration of marketing and creating relationships with the consumer. Granted I know this was only an internship, and it was a business analyst internship and not a marketing one, but it definitely allowed me to look critically at my life and future. From this experience I was able to determine what I liked about the job and what I didn’t. Essentially, I was able to see if this route is the right route for me going forward. All in all, I concluded that I still have a passion for business, and I will continue to pursue that passion, but I still have more searching to do in order to find the role that best suits my skills and me needs. Through STEP, this project allowed me to critically look at my life and make sure I am making the best possible decision for my future. In the end, I can use this information I gained from this experience as a guideline to how I finish my final year here at Ohio State. My STEP signature project was a summer internship with the HPS (Hydraulic Pump & Systems) division of Parker-Hannifin. This internship allowed me the new opportunities of working for a large corporation and living fully autonomously for three months. My first internship in the summer of 2017 was for a very small company where there was a strong focus on “now” rather than the future. The tasks were sometimes uneventful, but were always immediately important and the results implemented within two weeks at most. I thought that many large companies would work slower than this, but I was unprepared for just how slow that was. I came to realize within the first few weeks that this was an environment that I would not want to permanently work in. Meetings happened often, and many formal meetings would take place before any decisions were made. Though the work environment was not my preferred style, I appreciated the opportunity to work in a vastly different setting than I had before. Another important part of this project was being able to live alone. Previous to this, I had never lived in a place where my needs were not met. I did not realize how difficult it would be to live alone, nor how prepared I was to deal with the day to day challenges. It took until about mid-June before I felt comfortable living without a strong and close-by support system. By the end of the internship, I was more than happy to be living outside of a residence hall and away from my three younger brothers. I now feel that I will be ready to manage living alone once I graduate, as well as during my fifth year in off campus housing. The rate at which projects advance in a large corporation was shocking by the end of the internship. One example of this was finding a scanning company for old engineering drawings. This was a project that began in week 1 of the internship. It was in the last two weeks of the 12 week internship when the chosen company picked up some of the drawings as a sample of what they do. I originally thought that this would be a relatively fast project, but there were many people who needed to approve the spending, review the quotes, and sign privacy agreements. The scanning was planned to be done in large batches, and take many months to finish. Another example of this was collaborating with the Tube Fittings Division on a piece of software to improve the speed of modeling tubes in CAD programs. This project was first described in the early May. The first meeting was planned for early July, and a second meeting for the end of July. The software needed a few adjustments to properly connect with our servers, but these changes were fairly minimal. These two projects allowed me to realize the time it takes to complete tasks within large organizations can be significantly longer than planned. It also gave me a strong appreciation for how helpful technology can be. While these tasks took many months, they would have spanned much longer timeframes without the collaborative technologies that we used. These ranged from Skype for Business, Microsoft Sharepoint and Teams, as well as modelling software that allows better visualization of very complex parts. Towards the end of my internship, I had some trouble with my car. The power steering fluid was leaking, which made the car nearly undriveable. While this was being fixed, the mechanic noted that I desperately needed new tires on the car, and that they were dangerously worn down. Since my dad usually handles car maintenance, bills, and numerous other things, I felt unprepared to deal with a situation like this. However, I was able to find a qualified mechanic, determine what repairs were necessary and what could wait for another day, and get the tires replaced. Additionally, I could no longer transport myself to and from work. Since I was carpooling with another intern for most of the summer, he was able to provide transportation for the duration my car was unavailable. All in all, this cost around $1100 and took approximately two weeks to resolve. This was the one situation where I felt that I was in over my head at the start. By the end of it, I knew that I could navigate many more situations that I had never experienced before. Being two years away from graduating from Ohio State and starting a full time job is intimidating. I don’t feel like I am old enough to have the responsibility of living on my own or holding down a full time job with the responsibilities of an engineer. However, I will still have to do these things. This STEP project allowed me to gain a better grasp on both of these aspects of my life. I was able to successfully live on my own, manage a few small crises, and manage the stresses of working for a large corporation. Along with working for Parker, I was also able to gain a better understanding of what I was looking for in a career. I enjoy working in hands-on environments, as well as cross-disciplinary collaboration on projects. These allow me to learn something new and grow as an individual instead of completing repetitive tasks that are not personally fulfilling. The experiences I gained are going to help me every single day to become a stronger professional and a more independent person. I spent my summer, and STEP Signature Project, interning at Allegion specifically working in the engineering department of Global Portable Security. This included a move to Boston, MA for the summer where I learned all about their bike locks and the company. My main project for the summer was to perform testing on their different bike lock products in order to rank them and compare against their competitors. I also did smaller new product development projects and came up with a new test set up to test one of their new products. My STEP Signature Project opened my eyes to what my strengths and weaknesses are as an engineer compared to what I thought they were. Going in to the summer I had never worked as an engineer so this was my first experience in the industry. I learned a lot about how the engineering process works instead of just learning about it in school. My manager and mentor was also able to teach me valuable skills to be successful in the workplace. Throughout my time working at Allegion, what I thought was going to be my favorite project turned out to be my least favorite and what I thought I was going to hate was what I was most proud of. I went into the summer thinking that I wanted to do new product development after I graduated. After working on a new product project however, I found out that it was not what I enjoyed doing or what I had a natural talent for. This helped me better understand myself and where I want to be in my future. I found that sustaining and validation of products was very interesting to me and I thrived in that environment. I am excited to take these new skills and realizations of my talents to help mold and enhance my career goals and aspirations. Throughout the summer, I worked very closely with my coworker that worked in the machine shop on creating prototypes and validating designs. He taught me a ton about working in the shop. I had very little experience with many of the tools and machines and he was able to make me comfortable in all parts of the shop. In the beginning of the summer, I was afraid to work on many of the different machines since I had no experience and they could potentially be dangerous if used incorrectly. He was very patient and showed me the correct way of using not only the machines used to test the products but also other tools like the CNC machine, lathe and milling machine. When designing products, it’s important to understand how different parts can be made and this aided in that learning. While my coworker taught me to be comfortable in the machine shop and how to use the different tools, I learned that I really enjoyed this type of work. I found testing the different products to be a lot of fun where I could examine the locks after testing to see how they failed. After preforming different tests, I could predict how the product would fail in the real world which would allow us to alter the design based on these failures. By the end of the summer I found that not only did I enjoy doing this work but was more talented at this than expected. Because of this relationship with my coworker I was able to transform my ideas of what my future career in engineering will be. As a mechanical engineer, there are plenty of different parts of the engineering process that I could be a part of. After completing my project, I feel that I have a better idea of the direction I will take in my future career. This transformation in finding out what I enjoy and what I don’t is very valuable to my life. It is important to enjoy what you do in your work life and this development will aid in me finding a job I will like after I graduate. I will be able to change my future plans and goals to better reflect what I want to focus on and what I am good at. My STEP project was centered around my internship at 3M in Sydney, Australia. During my time there I analyzed the current onboarding system in place and created ways to improve upon it. Another component of my STEP project was living and working in another country and culture. Before my STEP project I did not fully understand what, it meant to work in Human Resources and work in an office full-time. However after I completed my internship I feel that I have a better understanding of what it means to work full time and how much different that routine is to my original assumptions about working full-time. Also during this internship my choices about working in Human Resources and working for a large, global company have become solidified. Also, during my internship, I was able to learn about a new culture. The Australian culture has many similarities to the culture in the United States, but also many differences. For example, Australians are much more outspoken than Americans, which was an adjustment that I needed to make. However, I am appreciative of these differences because they have made myself much more open to those of different cultures. My STEP Signature Project has reaffirmed my academic choices and has allowed me to become a global citizen. I believe that my transformation during my internship in Sydney, Australia was because of the relationships that I formed at my place of work. Everyone there was inviting, kind, and, I believe, wanted me to learn and succeed. I learned so much from my coworkers that I can apply to my own jobs when I graduate. In addition to learning about Human Resources at my job, I also learned about Australian culture. My coworkers were always very welcoming if I had a question that was not business related and they were also eager to learn if things were similar or different to that in the United States. Another aspect that led to my better understanding of Australian culture was being able to visit Brisbane, Australia. During my eight weeks in Australia, majority of my time was spent in Sydney since I worked five days a week. However one weekend, I went to the city of Brisbane with three other girls. During my time in Brisbane, I was able to visit a completely new city and learn more about Australian culture. Also while I was in Brisbane, I was able to hold a koala which was an absolutely incredible experience that I will never forget. Although I believe that my change was largely due to these two events, I also think it was due to the little things that I experienced in Australia, such as the food, the music, the transportation, etc. These little changes made everyday different and everyday exciting, which is rare to find in Columbus, Ohio, after living here for four years. I am truly grateful for all the time I spent in Australia learning about the country and myself in the process. This transformation is valuable in my life because I am able to apply what I learned at my internship throughout my career in Human Resources. The experience that I gained during my eight weeks there is irreplaceable. When I first signed up for my internships, I had a few expectations, but I realize now that all of my expectations have been exceeded and I feel more prepared for graduation and to enter the workforce since completing my internship. Also during my time in Australia, I had the extraordinary opportunity to learn about the Australian culture. This has allowed me to become more open to new experiences, new ideas, and new people. I think that this is also something that I can apply to my everyday life. I know in the future I will go to new cities and meet new people so by learning this skill is something that will benefit my life greatly.